This almost seems too easy. A 97-win juggernaut makes it to the NLCS, then in the off-season goes out and picks up the best free agent on the market — snatching him from a division rival — while losing none of its key young players from the year before, players who are now a year older and better. Why even play the season? But this is the Cubs we're talking about, a team that hasn't won a World Series since 1908, hasn't even been to one since 1945. That's the year that, legend has it, a fan whose pet goat was turned away at the gate cursed the team, declaring the Cubbies would never win it all again. And they haven't. This is a team that was in first place by nine games in August 1969 before a black cat walked across the field; it went on to lose 17 of 25 and finish eight games out of the playoffs. This is a team that, five outs from the 2003 World Series, was sabotaged when one of its fans deflected a foul ball. This is a team that has found 107 different ways to fall short, no matter how good it has looked. So maybe it's more like, Ugh, why even play the season? "I don't worry too much about curses," says manager Joe Maddon with a laugh. "I think they should be taken for what they are, an amusing fictional component to your legacy. We're not eating goat meat or anything over here." What they are doing is accepting that they are the World Series favorite as Opening Day approaches, and working to achieve that goal. There's a target on your backs, Maddon tells them. Embrace the target. "We're trying to turn what could be a negative into a positive," he says. "And I really think it is a positive. Why would you want to do anything that there's not pressures and expectations attached to? That would be a pretty boring world." ​Chicago deserves the high expectations. It welcomes back last year's NL Cy Young Award winner, righthander Jake Arrieta; last year's NL Rookie of the Year, third baseman Kris Bryant; and the fourth-place finisher in the NL MVP voting, first baseman Anthony Rizzo. Outside of Addison Russell, who is moving from second base to shortstop, last year's defense was questionable. But signing Jason Heyward away from St. Louis to play rightfield should help. 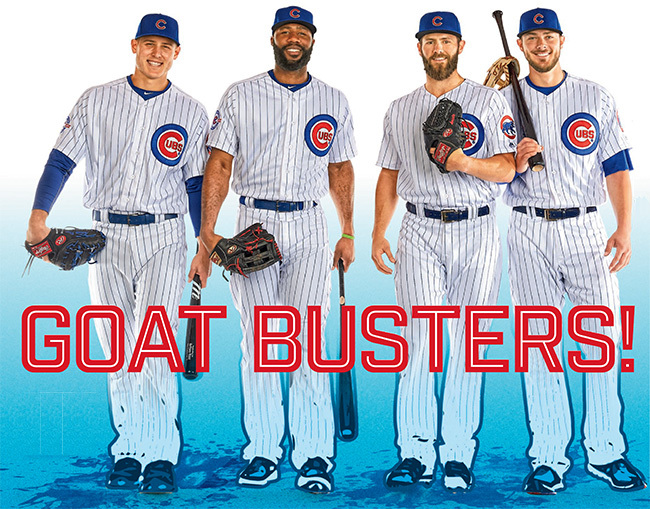 It's perhaps the Cubs' most talented roster in more than 100 years. And Maddon's speeches about respecting the process and quieting down the external noise seem to be working. The players wake up and take "sunrise yoga" classes at the team's spring training facility in Mesa, Arizona, before drinking made-to-order smoothies and heading outside to stretch as classic rock blares from the speakers. Be yourself, Maddon preaches, and they are. ​The Cubs could win the Central Division for the first time since 2008, when they went on to lose in the National League Division Series to the Dodgers. This season, they could win 100 games for the first time since 1935, when they lost the World Series to the Tigers. There are potential obstacles, to be sure: Even with that 97-win team last season, Chicago only made the playoffs as a wild card, behind a pair of division rivals: the Cardinals (100--62) and the Pirates (98--64). Or the Cubs could simply unravel and be their own worst enemy. This young team could fail to recover from an early slump, or a rash of injuries could weaken a pitching staff that, while strong, is not deep. Still, if the Cubs need help handling pressure, the team has a mental-skills coach, Josh Lifrak, who is ready to help the players hone their mind-sets. He has them focus on courage, urgency and belief in themselves, or C.U.B. His ultimate goal for them? "Big pile on the mound at Wrigley Field," he said last year. "Win the World Series." But with all this talk of titles, could the Cubs be getting overconfident? "We have not won a World Series in a century, so there's nothing to get complacent or cocky about," Maddon told MLB.com. Team president Theo Epstein agrees. "We try to walk around here and remind ourselves that we are a defending third-place team," he said to the Chicago Sun-Times. "It's obvious how much talent and how much character there is in our clubhouse. But we haven't accomplished anything yet. We have to go out and do it.... We have to overcome the adversity. We're excited about it." Cubs fans should be, too.